Bishop Emeritus William K. Weigand has served as a Bishop since 1980, appointed by Pope John Paul II. His episcopate began in the Diocese of Salt Lake City where he was noted for solid leadership, community building, outreach to the Spanish-speaking, and the restoration of the Cathedral of the Madeleine over his more than 13-year tenure there. 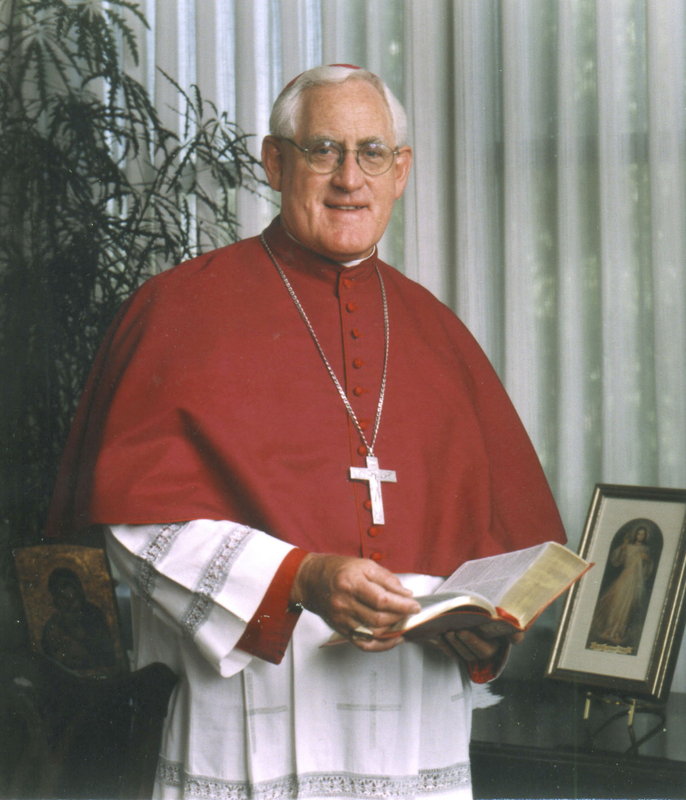 Upon arrival in Sacramento in January 1994, having significant experience as an Ordinary, Bishop Weigand initiated many plans and actions that would renew and inspire the faithful in the Diocese of Sacramento in the 21st Century. Most notably, Bishop Weigand welcomed the new millennia with the Jubilee 2000, an ecumenical prayer service at Arco Arena. He also called for a significant capital campaign, which would surpass all goals and provide for the future of the diocese in terms of capital improvements, priest retirement funds, and education. Bishop Weigand also committed to extensive research and study conducted by the Center for Applied Research (CARA) of Georgetown. This would lead to a more thorough understanding of the needs of the Diocese as parishioners, teachers, and clergy all were invited to participate. These data led Bishop Weigand to convoke the third diocesan Synod in 2004, Journeying Together in Christ, which closed in October 2006. Beyond the outcome of eight pastoral initiatives, which provided direction for long-range planning, the Synod also produced revised diocesan statutes. Concurrently, Bishop Weigand restored the beautiful Cathedral of the Blessed Sacrament, a necessary move to ensure the soundness of its structure for the future, but also to appropriately restore the luster of the historic Cathedral in the heart of Sacramento, and in the hearts of the faithful. Bishop Weigand’s commitment to Catholic education and vocations over the years, likewise, resulted in consistent progress in these areas. Bishop Weigand had long envisioned a Catholic institution of higher learning in Sacramento to ensure the full spectrum of Catholic education opportunities. This idea became reality in 2005 as the Legionaries of Christ opened the University of Sacramento. Earlier, in the mid-1990s, Bishop Weigand initiated the effort to establish a Cristo Rey High School in Sacramento. Cristo Rey High School fills a void and provides an innovative college preparatory education to students experiencing significant financial hardship and who otherwise would never dream of the gift of Catholic education. Cristo Rey High School is part of the national Cristo Rey network of high schools, operated locally by a unique partnership of three religious congregations – the Sisters of Mercy, the Sisters of Notre Dame de Namur, and the Jesuits. It opened its doors in August 2006 and as a co-founder, Bishop Weigand was pleased that his vision and passion for this school had been realized. Bishop Weigand responded to steady growth in the Diocese with a proactive response to the need for vocations. He fueled the Office of Vocations with a high-energy team of vocations promoters, and encouraged international recruitment to bring more priests to the region. Further, vocations committees formed throughout the Diocese at the parish level to ignite support and prayer among the lay faithful for local vocations. Bishop Weigand responded responsibly to the clergy misconduct scandal, which marked a very distressful time in diocesan history. He effectively implemented the Charter for the Protection of Children and Young People, worked through significant matters of litigation, and led efforts to achieve peace and healing. Throughout all 26 years of his episcopacy, Bishop Weigand has endured ill health, having been diagnosed with primary sclerosing cholangitis. In April 2005, he underwent a living donor liver transplant, returning to work full time by November of 2005. By October of 2007, Bishop Weigand’s request for a Coadjutor Bishop was realized and Bishop Jaime Soto, then Auxiliary Bishop of the Diocese of Orange, moved to Sacramento to begin to share responsibilities with Bishop Weigand. By November 2008, Pope Benedict XVI accepted Bishop Weigand’s resignation. Bishop Weigand presently serves (together with Bishop Francis Quinn) as Bishop Emeritus. He monitors his health, travels, and assists Bishop Soto as necessary.